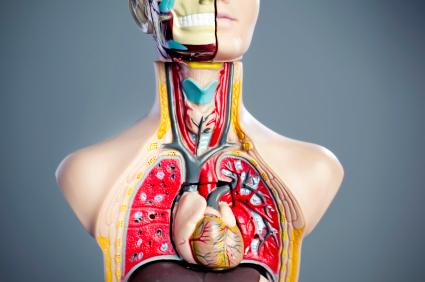 The millions of tiny bubbles at the business end of your lungs are amongst the most specialized tissues in your body. In order to permit fast exchange of gases between your blood and your breath these bubbles consist of only two skins, each of which is no more than a single thickness of cells stretched very thinly. This makes them extremely delicate and vulnerable, but so absolute is their dedication to this one function that they can do nothing else, least of all defend themselves. The merest whiff of solvent, acid, detergent or smoke can destroy them totally. So they are carefully guarded by a series of defences stationed at intervals along your airways. Your nose not only conditions air to your lungs’ liking, but alerts you to many airborne threats, and may trigger extra defences — mucus secretions, sneezing and nasal congestion — as well as making you want fresh air. These defences are perfect for normal conditions but can be overwhelmed by sustained challenges and by-passed altogether by newly-invented chemicals we do not yet know. Then defences lower down become important. Your wind-pipe and its rigid branches do their best with rather ineffectual coughing and inflammation. Your smaller airways, muscular and capable of shrinking their calibre almost to nothing, add this last desperate ploy to the defence of your vital gas-exchange skin. Except in very brief encounters this is futile, but your intention is clear enough. This is the basic process of asthma, which is mobilized in anyone by a challenge strong enough. Allergic people are peculiarly sensitive to a limited range of particular allergens as personal idiosyncracies, but all of us react in some way to obviously irritant or poisonous fumes, even in very small amounts. Thousands of chemical irritants are already widely prevalent and ten new ones are being introduced each week. Some of them like the organochlorine insecticides accumulate in your body fat and reduce your immune resistance to everything else. If you are well defended your nose bears the brunt, as rhinitis or sinusitis. Stubborn coughing means challenges have penetrated as far as your voice-box and wind-pipe. Asthma implies the deepest encroachment, all the way down to your smallest bronchial tubes. Any of these symptoms can also be provoked from within. Your bronchial muscle and nasal skin react similarly to anything, whether in the air you breathe or in your blood. 1. Make sure that all gas and paraffin heaters and cookers burn efficiently and are properly ventilated to the outside. Draw fresh air from the least polluted windows of your home. Avoid using pressurized aerosol spray-cans — even most medicines come in alternative forms. Get smokers to use a separate room. These precautions minimize your exposure to irritant gases. 2. An ioniser will efficiently clean and recharge the electrical quality of the air in your bedroom, car or living room. It would be unable to cope with a kitchen or mains electronic appliances. Larger units are available for workplaces. 3. Learn to breathe efficiently and always through your nose. During attacks inhale quickly and exhale very slowly: forcing your breath out only tightens your tubes. 4. Most attacks can be relieved by a hot pack treatment you can give an asthmatic without any expert knowledge; but attend carefully to the details (see Bathing). You will need two good dry towels, and three good face-cloths in a basin of very hot water. Strip the victim to the waist and sit him facing away from you. Rub a little cold-pressed vegetable oil up and down either side of his spine. Wring out one of the face-cloths quickly and spread it over his back, covering it immediately with several thicknesses of towel to keep in the heat. Replace it with fresh hot face-cloth every half minute for 15 applications in all. The sixteenth should be cold: drench the cloth under the tap, not in the basin. Wash off the oil with soap and water, dry and rest the victim for half an hour. You can repeat this if required, getting up to 50% relief each time. 5. Check yourself for allergies to foods and chemical additives. 6. Keep to a vegetable-based diet avoiding any food family you react badly to and falling back on the cleansing diet if you need to. 7. Supplement this for enhanced immunity if necessary. 8. Conventional medicines for asthma suppress symptoms very well but pay little or no attention to their cause. Osteopaths, homoeopaths and acupuncture practitioners tackle things differently: if you want to break a medical deadlock you may care to consult one of them.